Alan Serfoss , Great Falls Postmaster, credits, “carriers who have stepped up to the plate and the support and guidance of managers,” with being ranked number one nationally, for the first time. Jeff Durnell, one of three delivery supervisors, says that all delivery units, which include 70 carriers and assistants who are afoot as well as “mounted” (using vans and trucks), are ranked by a set of internal measurements of efficiency. According to Marcus Delgado, a city carrier for 8 years: “There have been lots of internal changes we’ve had to deal with relating to technological changes in order to stay competitive.” For example, he says that carriers can now alert customers when estimated delivery time approaches for parcels. Delgado says this is the type of question postal carriers like to address. (And in this case, while it is okay to get mail to a neighbor, patrons can also write, “incorrect delivery”.) 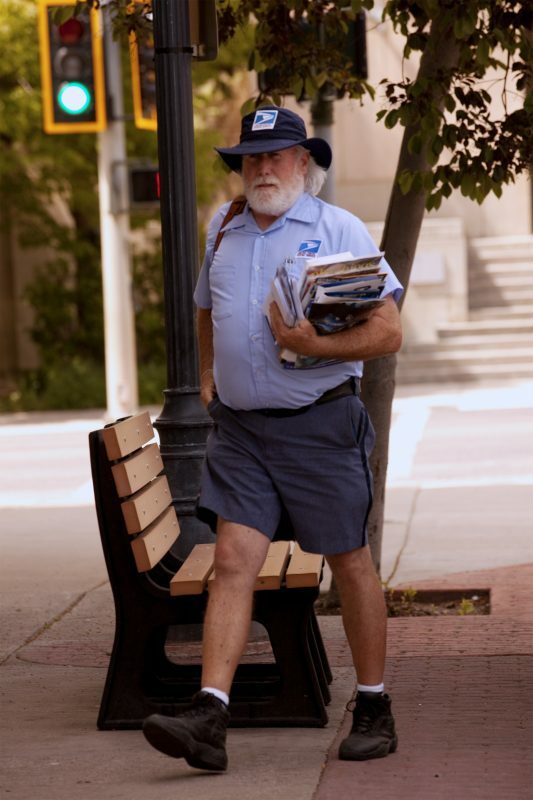 Letter carriers may walk from four to 12 miles a day depending on the route, and thus try to stay focused while saying quick hellos. Seasonal heat and cold also pose challenges along with carrying heavy bags and slips and falls. Marian and Lew Miller have resided in Great Falls for more than 50 years. They say that they were not surprised to hear that their mail carriers had been ranked #1 nationally for basic efficiency in their work. “That has been our experience in the 52 years we’ve lived in Great Falls,” she says. Speaking animatedly about their fondness for animals, especially dogs, Marian says their current canine companion, Star, is always eager to greet the carriers. Postal customers can also help by addressing mail carefully and by providing correct names on mailboxes. And for a “tip of the day”: When a package pink slip is received in the mail, customers do not need to take it to the post office. The slip can be signed and left for the postal carrier who will deliver it the following day.